Up early in Sorrento to make the appointment at Rome Airport, tea and a croissant at the bar round the corner from the B and B, watching the town come to life. The alleys were wet, washed down in the night, also I suppose to keep the dust down. Checked in with the lovely Giovanni on the reception desk but bad news “Mr Tim, the trains are on strike”. Oh gvfzxssx responded Mr Tim. But not to worry, you can catch the ferry. Ok, fine. Another breakfast and off down the elevator to the beach and the short walk to the port. Hang around in the heat, fainting, waiting, then join the pack and make a rush down the quay, no shade, to the ferry for Naples. The Bay (of Naples) opened magnificently before us as we steamed along, Vesuvius looming mysteriously over the City, but all around the periphery of the Bay there were mountains, shrouded in the heat haze at even ten thirty in the morning. Get the number one tram from the port to the train station I was told, good idea but a) where do I get a ticket ? and b) where do I get off ? Good questions in the ninety degree heat with my e-vest on and my duffle bag on my back. Got it figured out and arrived, pleased not being ripped off by a taxi driver, at the main railway station in Napoli. Easy ride at great speed up to Rome then the shuttle out to the airport. At the staton I had a few minutes before the flight arrived so took the opportunity to check on the trains to Pisa. All would be well if we got the 2.58 from the airport connecting with the 3.50 to Pisa from the Ostiense train station, not the main Rome station, Termini. J’s flight was on time. Out she came and we flew up the road to the ticket office, to see the train pulling out, sigh. Instant decision making, buy the ticket, get cab to Ostiense, catch train, no problem. Ah, but. No escalator back down to the Arrivals area, spotted an elevator, got in, down it went, then what, right or left ? We chose wisely and found a rather sultry young person who seemed to understand our predicament, loaded the bags and screeched out into the traffic. Seat belts on and tightened. Do we all understand tailgating ? Roaring down the AutoStrade at over 90, inches from the rear bumper of a Mercedes until he pulled over, passing buses on our left, weaving in and out, cutting people off brilliantly, she was taking the whole thing very seriously. Then into the Ostiense neighbourhood it became somewhat obvious that her GPS was not showing the exact position of the train station. We swooped around a large imposing glass and concrete building and she dropped us at the front door. Grabbed bags, paid (don’t ask) dashed through the door with eight minutes to go. Wait. What. We are in a bleeping supermarket and not only that, we can’t get out. Aaagh. Exhausted yet ? Spotted an info desk, ran over and scusi, train station? The young lady’s expression was priceless ” what are these mad tourists doing looking for a train station in here, this is a supermarket!” go out the door ,turn right, go two hundred yards, there is the train station. Gratsi. Run, dash, gasp, pant, ah, train station, spot elevator, descend, long spooky tunnel, more running, then a choice of fourteen platforms. Clock ticking. Check departure times, it’s gotta be platform four. Raced up stairs, looks right, and promptly fell about in a heap, laughing, we were looking for trains in a Supermarket !! Now pounding North through pleasant countryside, the train has compartments and ours is very lively, probably talking politics, much invective and gesticulations, of course no idea what they are talking about but that seems likely, it’s Italy. Talking of which, if you live on the left side of the pond you would think that this country is on the verge of collapse and people are running amok in the streets. Far from it, everyone is having a great time, cheaply. Cheap food, cheap wine, cheap holidays. 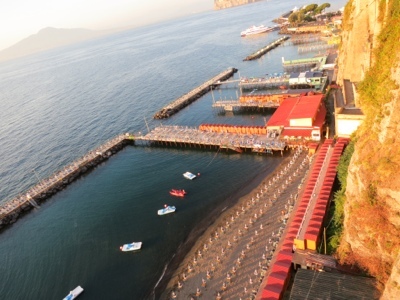 A family of four could save eight Euros by walking down to the beach in Sorrento and then back up again instead of taking the elevator. Meals of three courses instead of four or five. Lots of pizza eating. Ice cream parlours doing busy trade in one Euro cones instead of five or ten Euro sundaes. Small cars abound. There is a very obvious absence of tablet computers, crappy old laptops, yes, but shiny iPads, no. 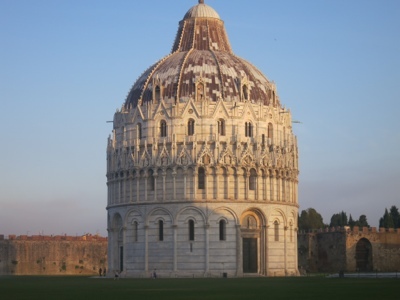 Looking forward to Pisa, see the Tower and maybe take foolish photos, find a decent bar, have dinner then off to Cinque Terre in the morning. It’s been a bit of a crazy day. Note artist in foreground at 6.30am. 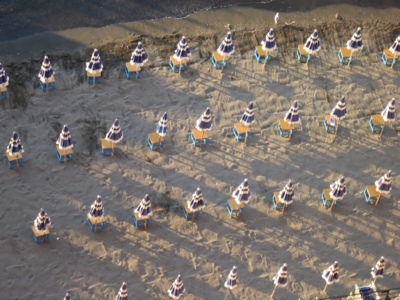 This entry was posted in Uncategorized and tagged Sorrento. 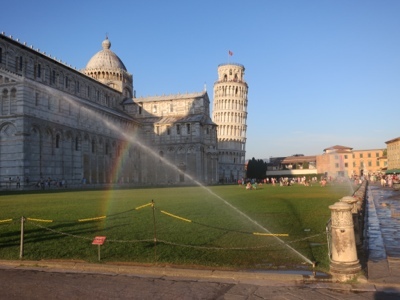 Pisa. Ostiense.. Bookmark the permalink.